In the previous article (http://ponnadi.blogspot.in/2013/06/anthimopaya-nishtai-1.html), we observed many pramANams that brings about AchArya vaibhavam and sishya lakshaNam. "puNyAmbOja vikAsAya pApadhvAntha kshayAya cha; srImAn AvirabUthbUmau rAmAnuja dhivAkara:" (புண்யாம்போஜ விகாஸாய பாபத்வாந்த க்ஷயாய ச; ஸ்ரீமான் ஆவிரபூத்பூமௌ ராமாநுஜ திவாகர:) - Just like a lotus will bloom on seeing the sun, Our sins and all darkness are cleared on the auspiscious appearance of the glorious sun "rAmAnuja". "Adhithya rAma dhivAkara achyutha bAnukkaLukkup pOgAtha uLLiruL nIngi, sOshiyAtha piRavikkadal vaRRi, vikasiyAtha pOthil kamala malarnthathu vakuLa bUshaNa bAskarOdhayaththilE" (Acharya hrudhayam - ஆதித்ய ராம திவாகர அச்யுத பாநுக்களுக்குப் போகாத உள்ளிருள் நீங்கி, சோஷியாத பிறவிக்கடல் வற்றி, விகஸியாத போதில் கமல மலர்ந்தது வகுள பூஷண பாஸ்கரோதயத்திலே) - The darkness/ignorance in the material world which was not removed by the appearance of srI rAma and krishNAvathArams are removed by the appearance of nammAzhwAr (vakuLAbharaNan). Thus the appearance of Acharyan is cited as the cause for the removal of endless darkness in the samsAram (material world). It is said that as soon as a bhAgavatha's merciful vision falls on some one, it will remove all obstacles/hurdles in reaching the ultimate goal and will require no other effort from individuals to relieve themselves from samsAram. 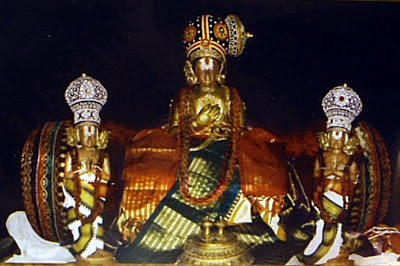 Those individuals who are the object of the mercy of an AchAryan, even though might have been great sinners, all their karmAs will fully be destroyed at the moment of taking shelter of the AchAryan and will become completely purified and subsequently will reach the divine abode of srIman nArAyaNan - paramapadham. This can be further understood from the following references. Oh mind! the relationship with srIman nArAyaNan and us (jIvAthmAs) are eternal - but we realized that only by the divine instructions of our Acharyan and thus became enlightened. So, we should always proclaim that with gratitude towards the AchAryan without fear. srIvachana bhUshaNam - sUthrams 408 and 409.
unNdapOthoru vArththaiyum unNnNAthapOthoru vArththaiyum cholluvAr paththuppErunNdirE, avargaL pAsuram konNdanRu ivvarththam aRuthiyiduvathu (உண்டபோதொரு வார்த்தையும் உண்ணாதபோதொரு வார்த்தையும் சொல்லுவார் பத்துப்பேருண்டிரே, அவர்கள் பாஸுரம் கொண்டன்று இவ்வர்த்தம் அறுதியிடுவது). There are 10 AzhwArs who glorify bhAgavathas when there is bhagavath anubhavam but chastise them when there is no bhagavath anubhavam (out of extreme sorrow due to separation). AchArya vaibhavam is not established through the words of those AzhwArs. avargaLaich chiriththiruppAr oruvarunNdiRE; avar pAsuram konNdu ivvarththam aRuthiyidakkadavOm (அவர்களைச் சிரித்திருப்பார் ஒருவருண்டிறே; அவர் பாஸுரம் கொண்டு இவ்வர்த்தம் அறுதியிடக்கடவோம்). There is madhurakavi AzhwAr who laughs at other AzhwArs since he is always situated in glorifying nammAzhwAr. We are establishing AchArya vaibhavam using his words. 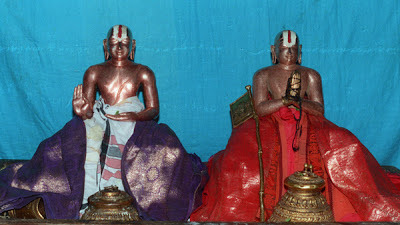 Translator's note: madhurakavi AzhwAr, in the last pAsuram of kaNNinuN chiruththAmbu, declares that the ones who believe in his words and follow nammAzhwAr with devotion, they are guaranteed to see srIvaikuntam (paramapadham). Translator's note: In the next (lengthy) paragraph, the author compares nammAzhwAr's words on emperumAn and equivalent words of madhurakavi AzhwAr on nammAzhwAr. We can easily understand the glories of AchAryan which is even greater than bhagavAn himself from this comparison. In the published grantham, this paragraph is not complete and is identified that the remaining portion of the paragraph is missing in the original copy itself. inGE thirinthErkkizhukkuRREn (இங்கே திரிந்தேர்க்கிழுக்குற்றேன்) - What is the loss for the people of this world in worshipping bhagavAn in this world itself? thirithanthAgilum dhEva pirAnudaik kariyakOlath thiruvuruk kANban nAn (திரிதந்தாகிலும் தேவ பிரானுடைக் கரியகோலத் திருவுருக் காண்பன் நான்) - Again, I will see (worship) the divine form of the leader of nithyasUris here in this world - madhurakavi AzhwAr who is an AchArya nishtar himself worships emperumAn since that is pleasing to his AchAryan. kadiyanAyk kanjanaik konRa pirAn (கடியனாய்க் கஞ்சனைக் கொன்ற பிரான்) - bhagavAn is the one who killed kamsan and did me great favours (AzhwAr shows here that bhAgavathas should consider any favours done by bhagavAn to other bhAgavathas as favours done to themselves) sadagOpan (சடகோபன்) - nammAzhwAr who drove out the ignorance named "sadam" which covers us during our birth. ottumO ini ennai negizhkkavE (ஒட்டுமோ இனி என்னை நெகிழ்க்கவே) -Will bhagavAn allow me to fall down from my nishtai? (No) enRumennai igazhvilan kANminE (என்றுமென்னை இகழ்விலன் காண்மினே) - nammAzhwAr will never let me fall down from my nishtai. Translator's note: The following paragraph brings out the qualities and greatness of AchAryan through piLLai lOkAchAryar's srIvachana bhUshaNa dhivya sAsthram which is best understood with maNavALa mAmunigaL's vyAkyAnam. sUthram 308 - When an AchAryan gives instructions which are focussed on the well-being of the sishya, he should not misunderstand the nature of himself, the sishyan and the result. Such misunderstanding will lead to total failure for the AchAryan. sUthram 309 - Misunderstanding self means thinking that "I am the AchAryan" (He should think he is the sishyan of his AchAryan). Misunderstanding sishyan means "He is my sishyan" (He should think that the sishyan is his own AchAryan's sishyan). Misunderstanding the result means thinking that the result is materialistic, upliftment of the sishyan, engaging the sishyan in bhagavath kainkaryam and having good company for himself while being in this samsAram. sUthram 310 - While the AchAryan should not consider the result as explained above, it will naturally happen. By the desire of sishyan (who must work for the material needs of the AchAryan) material/body needs will be fulfilled. By the desire of bhagavAn, sishyan will be uplifted. By the desire of AchAryan, bhagavath kainkaryam will happen through the sishyan. By the gratitude of the sishyan, he will constantly engage in the company of AchAryan while being in this samsAram. sUthram 311 - The real result (sishyan engaging in mangaLAsAsanam - looking out for the well-being of bhagavAn) will happen by the desire of the AchAryan himself. AchAryathvam (AchAryan's position) will be established by him focussing on the real goal of engaging others in mangaLAsAsanam and by the desire of bhagavAn. sUthram 312 - Unless the AchArya-sishya relationship follows the above conditions, both the AchAryan and sishyan dont qualify to be called as such. sUthram 313 - AchAryan should have mercy towards his sishyan and total dependence towards his own AchAryan. sUthram 314 - sishyan's true nature will be established by receiving the mercy from the AchAryan and AchAryan's true nature will be established by showing total dependence on his AchAryan. sUthram 315 - True AchAryan is the one who instructs the thirumanthram (dhvyam and charama slOkam) with the meanings. sUthram 316 - Others who instruct manthrams that are glorifying bhagavAn, yet are focussed on material benefits dont qualify to be AchAryan. (Translator's note: Subsequent sUthrams explain that bhagavath manthrams other than thirumanthram are not complete and are not fully focussed on ultimate benediction of bhagavath kainkaryam - this is explained in mumukshuppadi also very clearly). sUthram 328 - AchAryan should focus on the upliftment of the sishyan. sUthram 333 - AchAryan should nurture the sishyan's svarUpam (AthmA). sUthram 335 - Nurturing the sishyan's bodily needs is against the nature of a true AchAryan. sUthram 337 - AchAryan should take care of his bodily needs using his own wealth (i.e., a sishyan should submit all his wealth to is AchAryan considering they belong to his AchAryan). sUthram 338 - AchAryan should not accept sishya's wealth (i.e., if the sishyan does not voluntarily/wilfull submits his wealth and thinks it still belongs to him, the AchAryan should not accept that). sUthram 339 - If accepts such wealth (as explained in previous sUthram), he will be considered as a needy/beggar. sUthram 340 - Since a true AchAryan is already content with great spiritual wealth, he will not accept such wealth. sUthram 341 - It is because of his content nature, his true quality of being an AchAryan manifests in him. sUthram 427 - Surrendering to bhagavAn is like holding his hands and requesting him to help; Surrendering to an AchAryan is like holding on to bhagavAn's lotus feet and requesting him to help. (i.e., the latter is better). sUthram 430 - bhagavAn himself likes to be an AchAryan. sUthram 431 - that is why he became the prathamAchAryan (first AchAryan) in our guru paramparai and instructed bhagavath gIthai and accepted vibhishaNan's sharaNAgathi. sUthram 432 - To be able to repay the AchAryan, we need another bhagavAn and another set of spiritual/material worlds. (Since bhagavAn and his wealth (the two worlds) are under the disposal of AchAryan and as the AchAryan blesses us with the same, to be able to repay him, we need the equivalent of those two - this means, we can never truly repay for the favours done by AchAryan). sUthram 433 - Relationship with bhagavAn is the cause for both bandham (our continuous journey in samsAram in various births) and mOksham (salvation). Relationship with AchAryan is the cause for mOksham only. sUthram 437 - When the sishyan's relationship with the AchAryan breaks, even if the sishyan is full of knowledge and detachment, there is no use in the end. 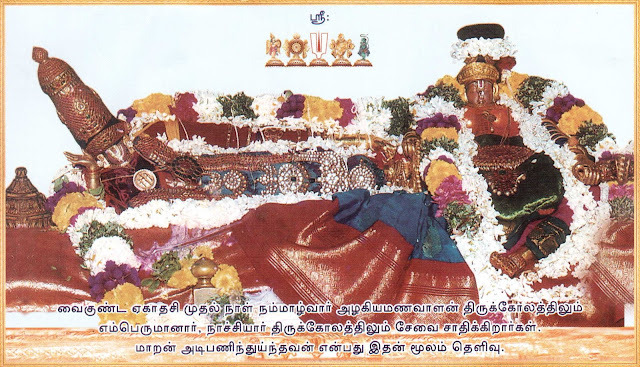 sUthram 438 - When a woman has mAngalyasUthram (husband is alive), she can wear any ornaments, but when she loses the mAngalyasUthram (after husband passes away), those ornaments will only cause anxiety (since she cant wear them any more). sUthram 439 - Without AchArya sambandham, there is no bhagavath sambandham. sUthram 443 - vadakku thiruvIdhip piLLai often quotes "For the jIvAthmAs who have been thinking "I am the controller" since time immemorial and thus lost the favour of bhagavAn, the mercy of AchAryan is the only refuge for salvation". sUthram 447 - Mercy of AchAryan is the only way for upliftment for the sishyan. nAnmugan thiruvanthAdhi 18 - mARAya dhAnavanai - Here thirumazhisai AzhwAr glorifies the ones who are totally surrendered to narasimhan and declares that it is best to be surrendered to those devotees and look out for their mercy. sthOthra rathnam - akruthrima charaNAravindha - Here ALavandhAr declares that bhagavAn should accept him not for his own knowledge/bhakthi but for him being related to nAthamunigaL who is extremely dear/attached to emperumAn. purANa slOkam - pasur manushya pakshIvA - An animal, human or bird - irrespective of the birth (whether that qualifies for pursuance of knowledge through sAsthram or not), the connection with a vaishNava will deliver to parampadham easily. sUthram 461 - AchArya's mercy is similar to prapathi - that it acts both as an independent upAyam (process) as well as supporting other upAyams. sUthram 462 - For the one who is incapable to do bhakthi, prapathi is there; For the one who is incapable to do prapathi, AchAryan's mercy is there. sUthram 463 - AchArya's mercy will first establish the true understanding of the nature of the self (i.e., we are servants of bhAgavathas); then it will nurture the true understanding of us accepting only bhagavAn/bhAgavathas as the refuge; finally it will engage us in true kainkaryam for bhagavAn/bhAgavathas. Translator's note: The above section is a simple translation of the quoted sUthram's from srIvachana bhUshaNa dhivya sAsthram. It is highly recommended that these are heard from a proper AchAryan to grasp the full and in-depth meaning of the various sUthrams. periyavAchAn piLLai says "The one who tolerates is not AchAryan, the one who accepts (material benefits) is not AchAryan, but the one instructs/controls the sishyan (for the well-being of the sishyan) is the true AchAryan". An AchAryan who has misconstrued interests should be given up. Such AchAryan will explain/discuss unnecessary/materialistic aspects. AchAryan should be focussed on the upliftment of jIvAthmA. AchAryan is not the one who himself is drowning in the ocean of samsAram - instead he is the one who is safe himself due to full knowledge in bhagavath vishayam (with proper anushtAnam - practice) and helps others to be rescued. For a sishyan, just meditating on a true AchAryan's divine form itself is sufficient - he does not even need to get knowledge/instructions from the AchAryan. Just like meditating on garuda manthram will relieve the poison of snake bite, meditating on the AchAryan's form will relieve the sishyan from the poison of samsAram. AchAryan should be a well-respected person who is not attached to material wealth, lust, etc and the one who nurtures true knowledge in the sishyan. Next section discusses the true nature of a sishyan. very tough work.....comparative paasurams of the paramaacharyar and his disciple and relevant sutras from sri Lokacharya is a delight. thanks for the mangaLAsAsanam swamy - yes swamy, this grantham is relatively tough to translate (especially the first few sections that are full of pramANams) - only by bhagavath/bhAgavatha/AchArya katAksham this is happening. Brilliant comparison of the pasurams of the supreme Acharyan and his great disciple Madhurakavi because of his tireless effort, we were fortunate enough to get the திருவாய்மொழி அனுபவம் in our lives. Thanks for sharing. amazing comparison of azhvar's pasurams with madhurakavi azhvar's kanninunsiruthambu. very delighted! thank you very much Sarathy swamin. Dhanyosmi.